PreHab. Joint Replacement Surgery. ReHab. Recovery begins before joint replacement surgery. Let the PeerWell app guide you towards a healthier tomorrow. Exercises target the muscle groups affected by joint replacement surgery. Our low-impact exercises will improve your strength, balance and range of motion. The PeerWell program jumpstarts weight loss and can improve cardiac health before the stress of surgery. After your replacement, continue customized target exercises to get back on your feet faster. Small diet changes can promote healing, improve blood sugar control and reduce inflammation before and after surgery. The PeerWell app shares the superfoods, nutrients, and recipes that gives your body what it needs to kick recovery into high-gear. Surgery is scary and the thought of ReHab can be just as daunting. Mentally prepare, reduce anxiety and keep fear at bay with our in-app mindfulness program, drug-free pain management techniques and community support. How will you get to the hospital? What changes should be made to get your home ready for recovery? You’ll need to make some adjustments to your life (and environment) in order to recover quickly and comfortably. PeerWell helps you organize all of the “extras” that you haven’t had time to think about. Surgery is tough enough without having to worry about complications. Our program helps you reduce your risks by curbing unhealthy behavior. PeerWell will steer you away from the common pitfalls that lead to infection, surgery revisions and poorer joint replacement outcomes. As you know, pain management is tricky. 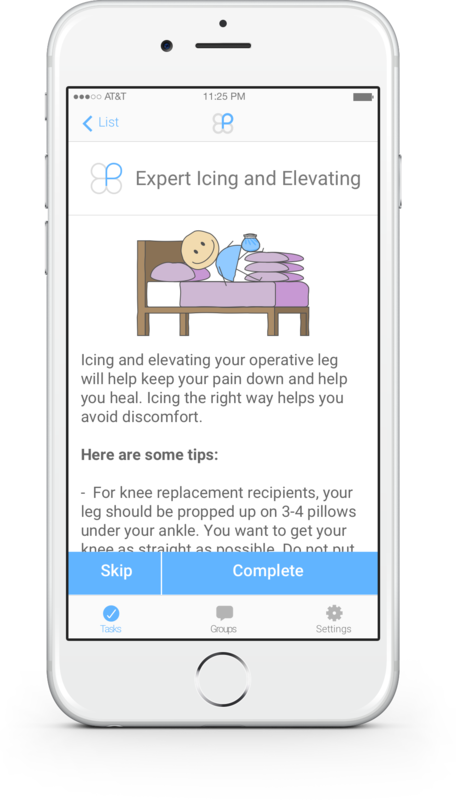 Our app arms with you with proven opioid-free pain management skills to help control your pain, your way, for the long-term. Learn cutting-edge techniques that will help you get through painful surgery prep and recovery. 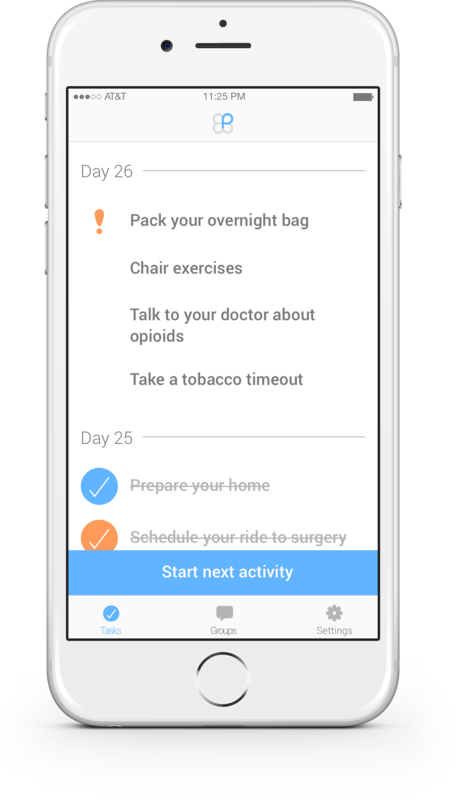 Each day, get a customized list of the exercises, activities and interactive lessons that will have the greatest impact on your surgery prep and recovery. PeerWell tracks your progress, letting you challenge yourself and compare how well you’re doing to peers. 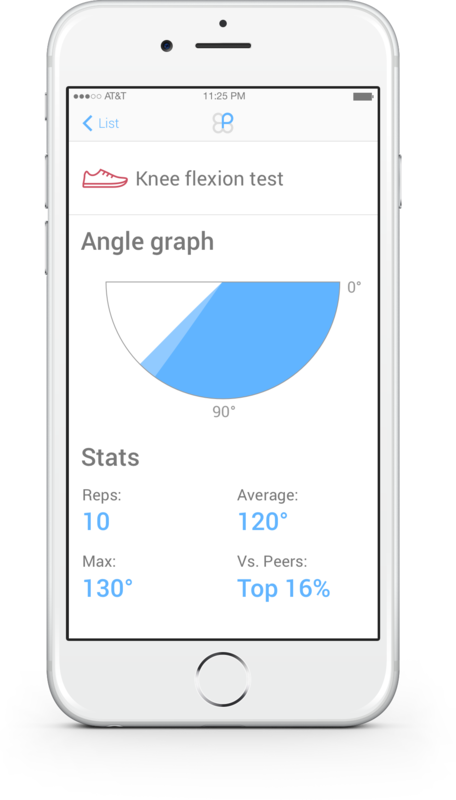 In-app progress tracking includes the world’s first mobile range of motion/flexion measurement tool. Each activity in the program was designed by field experts who understand joint replacement surgery better than anyone. PeerWell delivers a cutting-edge plan fueled by leading technology.